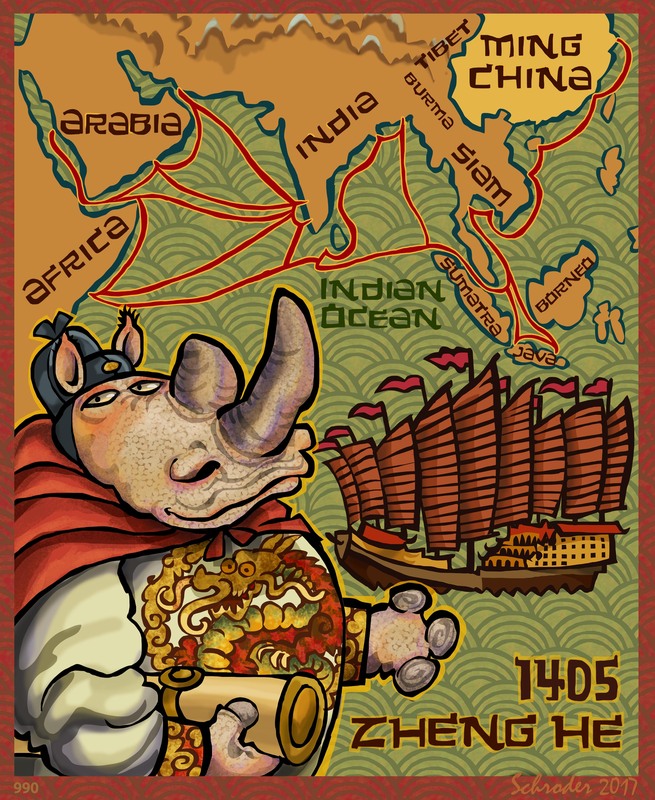 Today, in 1405, Zheng He led a mighty Armada of 300 ships and 62 Treasure Ships off to sail around Asia, as shown. It took 7 separate trips, but he logged lots of nautical miles over the next 28 years. Why he went is a bit hazy to this day. His ship was 1.5 football fields long (450 feet) and 60 yards wide. Nine masts, and housing 1,000. This presented ideal circumstances for Rhino stowaways, since We blend into crowds with ease. Cagey, that’s Us. Rhinos are not natural sailors, so We would get off and walk, whenever possible. Sumatra and Java are always R party countries.